How Can You Scale Your REST API Testing? REST API is a powerful way to run tests, however it’s not always enough. There are some pitfalls that cannot be spotted by REST API testing alone. And here comes the importance of end-to-end test automation. For example, during the process of writing this article, I tested NASA’s public API and discovered a bug in one of their API schemas. I could not have discovered this bug unless I would have gone through the entire cycle of end-to-end testing. This clearly emphasizes the vast importance that end-to-end testing has in a product’s life-cycle, and we should not underestimate the power of combining API and UI automated testing for better coverage and quality. TestProject‘s end-to-end test automation framework just released a new open source addon for RESTful API clients. It provides actions to send HTTP/S requests using GET, POST, PUT and DELETE methods and is completely open source. You can see the documentation and source code for it here. Send API commands to the server and validate responses. Use values from responses as parameters in test steps. 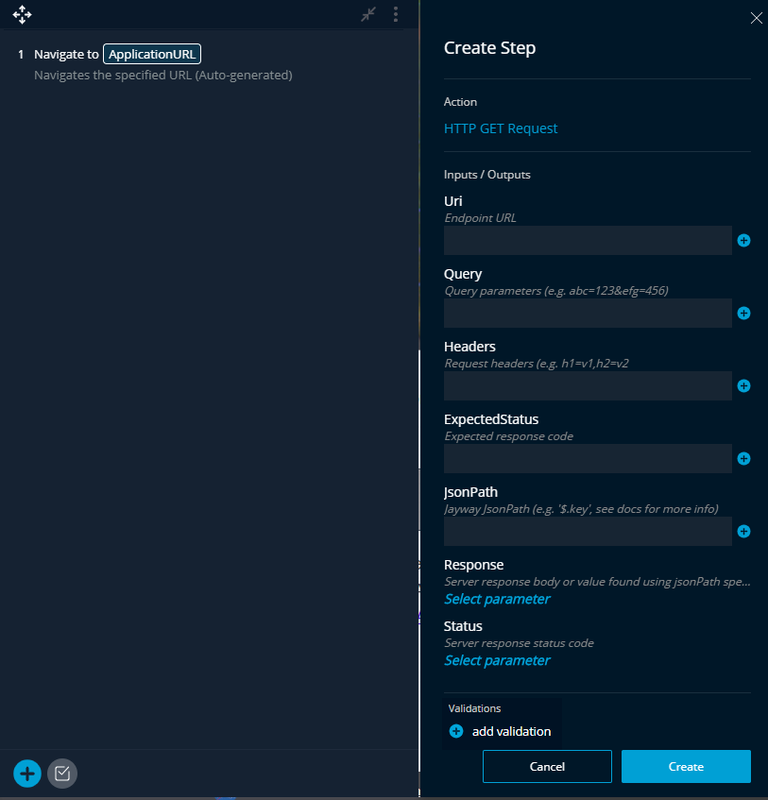 Combine REST API and recorded UI steps within the same automated test to achieve end-to-end testing. You have a TestProject account, you can get it for FREE here. You have a TestProject agent installed, watch how to install a TestProject Agent here. You have installed the REST API Addon, you can find it in the TestProject addons library here. We will use NASA’s APIs as an example, not just because we LOVE science but since it is also publicly available 😊. The Near-Earth Object Web Service which is a RESTful web service for near earth Asteroid information, allows users to search for Asteroids based on their closest approach date to Earth. 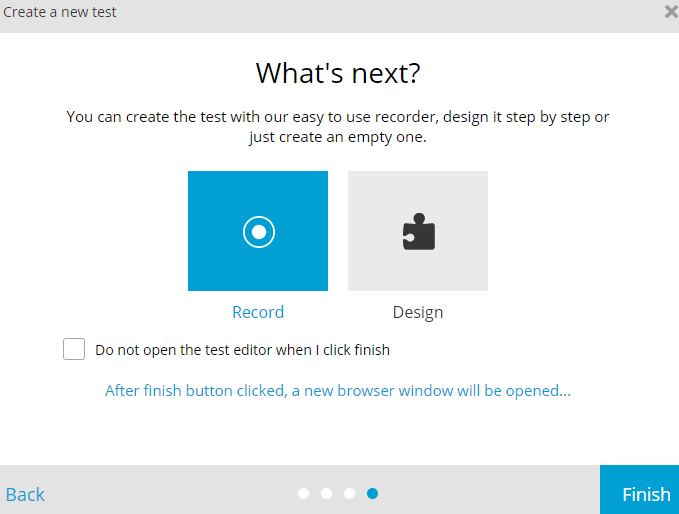 Step 1 – Open your TestProject account and create a new recorded test. 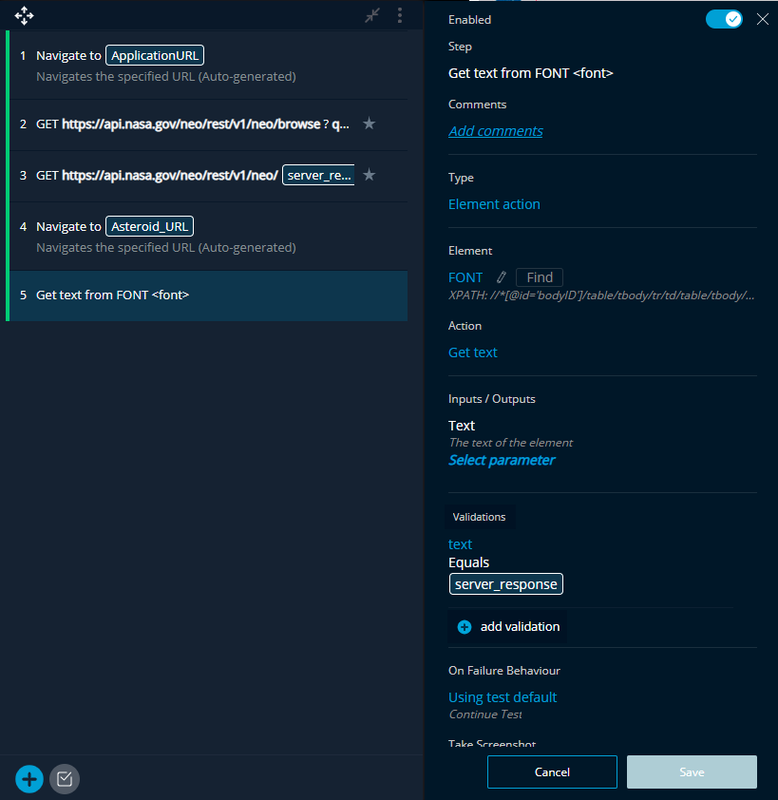 Step 2 – Retrieve all of the available asteroids by using GET API command and extracting the first asteroid ID (https://api.nasa.gov/neo/rest/v1/neo/browse?api_key=DEMO_KEY). 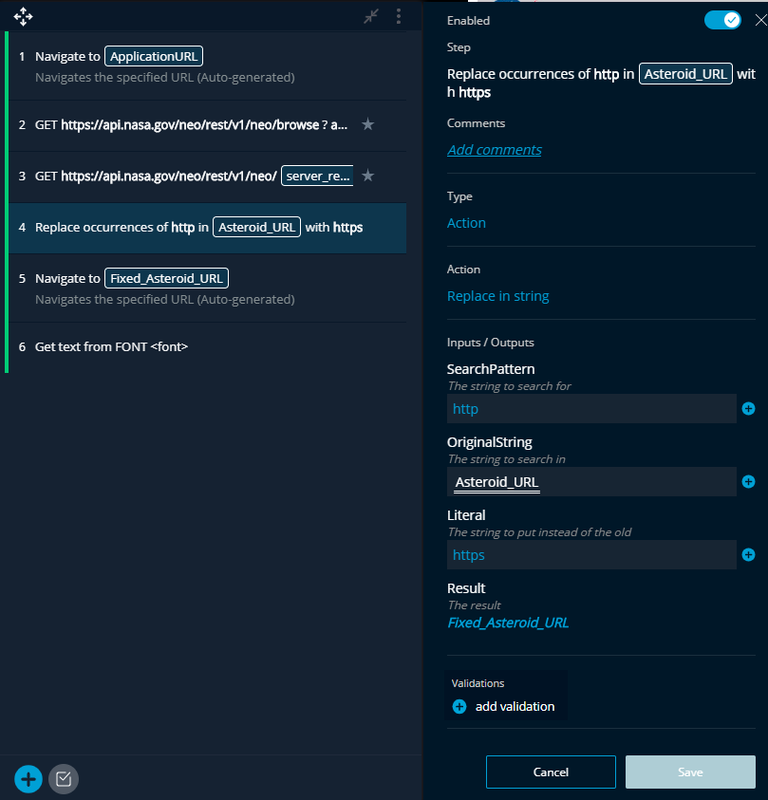 Step 3 – Create a dynamic endpoint URL according to the first asteroid ID retrieved, analyze the server’s response and extract the value of “$.nasa_jpl_url”, which represents the URL to a web page that provides information about the asteroid. Step 4 – Replace the URL with a valid structure (adding ‘s’ to the HTTP string) – this is not something that you should do in a real-life scenario. However, we did it to overcome the bug we found in the response schema. Step 5 – Navigate to the asteroid URL (the correct one we fixed). Then, validate that the asteroid ID label that is presented in the web page matches the ID that was extracted in step 2. Step 6 – Analyze reports of our recorded test. 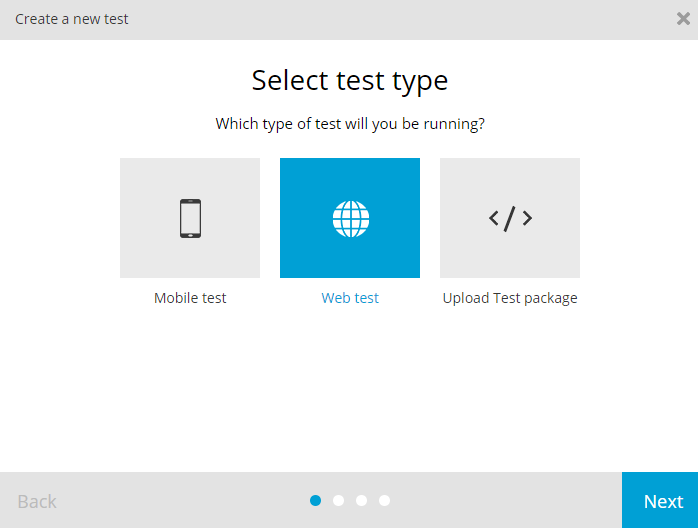 Open your TestProject account and create a new test. 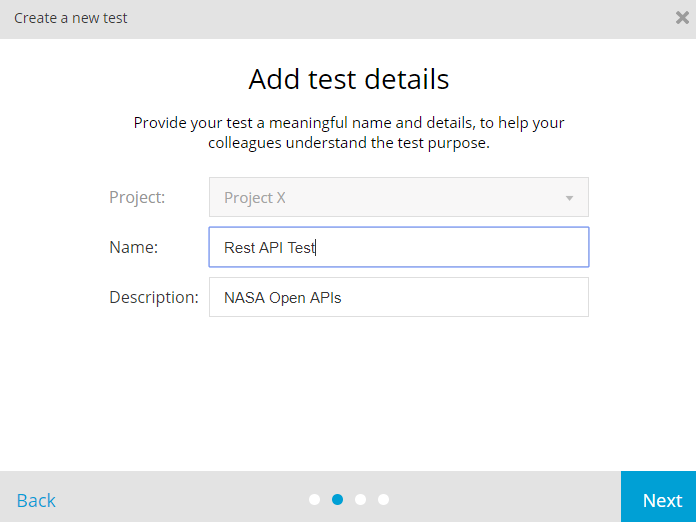 Then, you will need to provide test details, such as the test name and its description and supply the tested URL (https://api.nasa.gov/api.html#neows-feed). 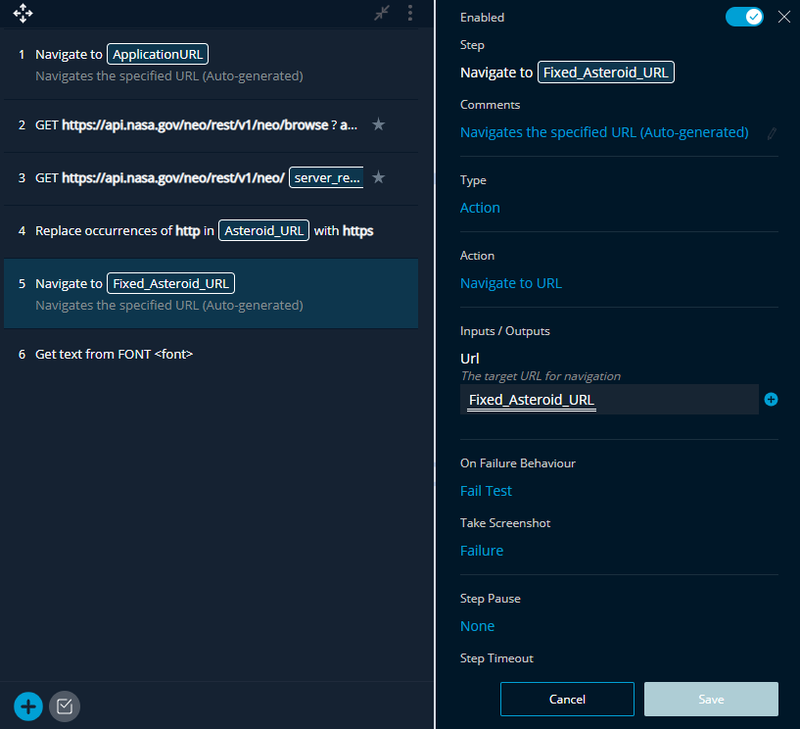 Since our test will mostly rely on REST API commands, which contains the URL as part of the steps, the initial application URL doesn’t play a major role here, yet should be supplied as part of the Web test default parameters. A new browser tab will open within TestProject’s test recorder. In our initial step, we will retrieve all of the available asteroids by using GET API command and extracting the first asteroid ID (https://api.nasa.gov/neo/rest/v1/neo/browse?api_key=DEMO_KEY). api_key=DEMO_KEY (you can add multiple parameters here separated by ‘&’). We will enter the code “200”. According to NASA’s documentation, the expected server status in case the request is valid will be 200. $.near_earth_objects.neo_reference_id (based on Jayway JsonPath syntax, we are looking for a first neo_refernce_id, that will be passed as part of the endpoint for our next step). We will also add a parameter (server_response) for the Response field, in order to store the retrieved first neo_reference_id. Now, let’s create a dynamic endpoint URL according to the asteroid ID that was retrieved above, and extract from the server response the nasa_jpl_url which represents the URL to a web page that provides full information about the asteroid. 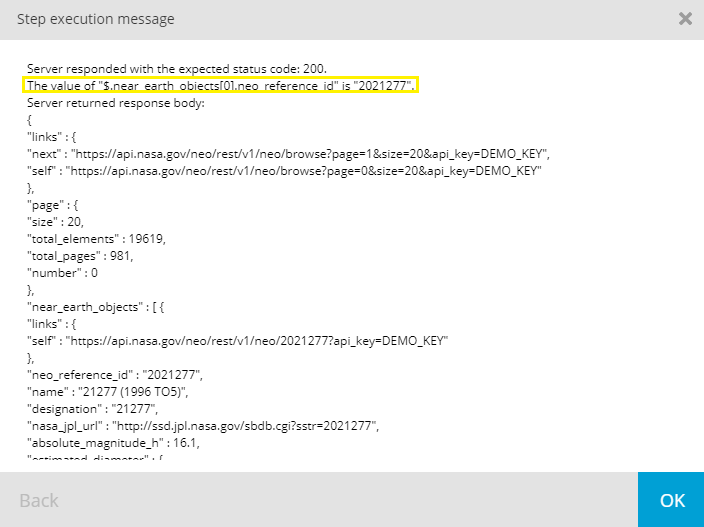 According to NASA’s API documentation, the asteroid ID (aka neo_reference_id) that was retrieved above is part of the endpoint that provides us detailed asteroid information as shown in the following example: https://api.nasa.gov/neo/rest/v1/neo/2021277?api_key=DEMO_KEY. 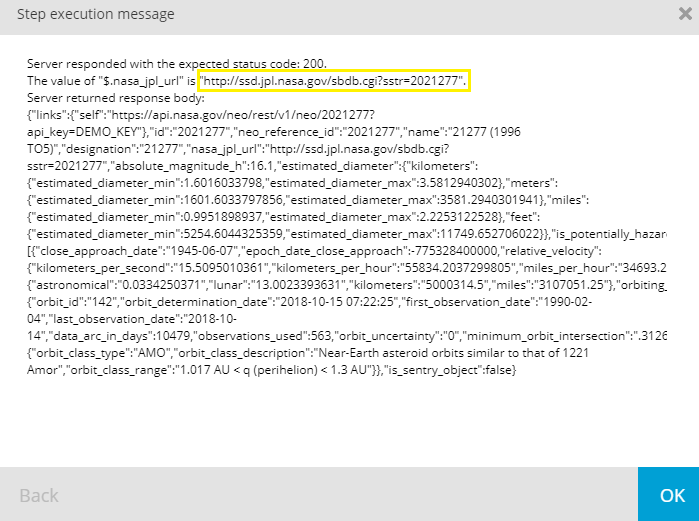 In this step, we will create a GET request by using the neo_reference_id value that was stored in the server_response parameter, to assemble the endpoint URL and retrieve a new value called nasa_jpl_url from the response message. $.nasa_jpl_url (based on Jayway JsonPath syntax, we are looking for a nasa_jpl_url value). We will also add a parameter (Asteroid_URL) for the Response field, in order to store the retrieved value (nasa_jpl_url). Now, let’s run our test steps and view the result. As seen in the response schema displayed below, we received the specific asteroid id details. 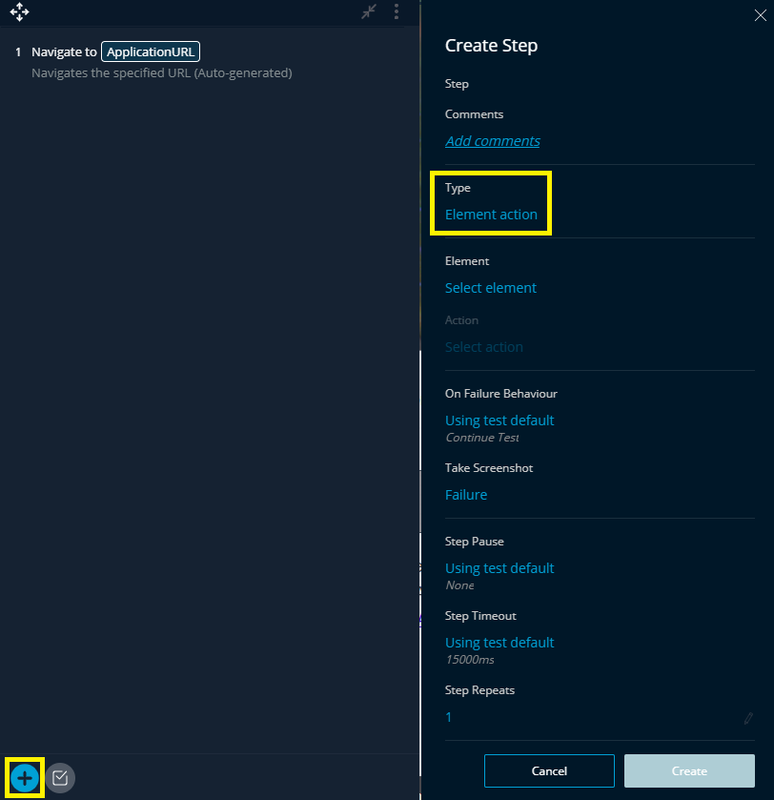 Both GET requests (from step 2 and from step 3) are related: the second call (in this step – step 3) is going to a specific endpoint based on the first REST API call (from step 2). This is the URL that was retrieved from value nasa_jpl_url and stored in Asteroid_URL parameter: http://ssd.jpl.nasa.gov/sbdb.cgi?sstr=2021277. If you will test it in your browser, you will see that the URL link leads to an incorrect web page. The correct URL NASA has been using is based on secured HTTPS (and not based on HTTP that was retrieved in the value nasa_jpl_url). Therefore, let’s add a step to our recorded test that replaces the HTTP with HTTPS and creates a correct URL address. *It’s important to mention that this is not something that you should have to do in a real-life scenario, but rather instead, you should simply open a bug for your development team. In our case, we already sent an email to the folks at NASA and we are sure they will fix it really soon 😊. Result: New parameter called Fixed_Asteroid_URL. Now, let’s run this step as part of our test to create a correct URL. In the “Get text” step details, we will add a validation by clicking the (+) button. In the “Select Field”, choose: “text”. In the “Select validation type”, choose: “Equals”. In the text box, we will select the server_response parameter which contains the original asteroid ID. 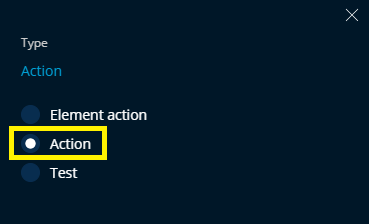 This action will compare the UI label ID with the ID that was retrieved from the API (in step 2 above). This tutorial covered an entire workflow of end-to-end automated tests, all while using TestProject‘s framework. We started this tutorial by sending basic API calls, and ended it with validating and comparing UI based elements. Basically, we combined REST API and recorded UI steps within the same automated test, and thus achieved a powerful end-to-end test. And all of this happened without a single line of code, which is pretty cool! I think it’s important to mention here the fact that recorded tests sure are limited to a certain extent, and there are definitely some circumstances in which you must utilize your coding skills. Thus, I completely relate to those who aren’t so very fond of recorded tests. 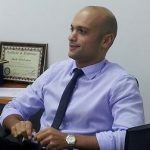 However, I wrote this tutorial to demonstrate just how easily one can leverage the capabilities of TestProject’s smart test recorder, take an entire testing cycle to a whole new level and create a powerful end-to-end automated test (in this case, while using TestProject’s test recorder that incorporates built-in capabilities as well as custom addons such as REST API). As we’ve seen in this tutorial, end-to-end tests are crucial for any product’s life-cycle and quality, and without it – we might even miss some bugs along the way.